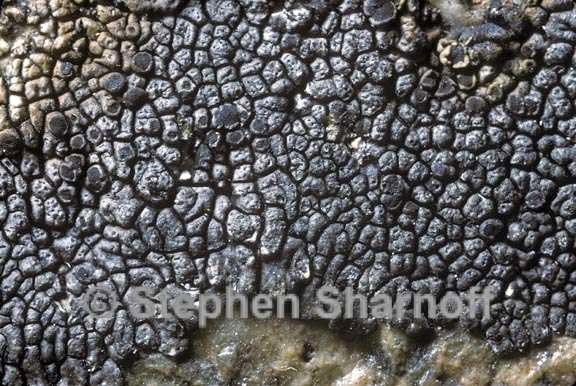 Life habit: lichenized Thallus: thick to thin and strongly radiate-plicate at margin, areolate in center; prothallus: absent areoles: plane to slightly convex, 0.4-0.8 mm wide surface: dark brown, dull Apothecia: infrequent, cryptolecanorine becoming lecanorine and adnate or sessile, usually one per areole, 0.2-0.5 mm in diam. disc: black, dull, persistently plane; epihymenium: brown hymenium: hyaline, I+ blue; paraphyses: simple or weakly branched; hypothecium: hyaline asci: cylindrical, 8-spored ascospores: brown, 1-septate, 9-13 x 5.5-7.5 µm Pycnidia: immersed, obpyriform, several per areole conidia: hyaline, simple, bacilliform, 5-6 x 1 µm Spot tests: K-, C-, KC-, P- Secondary metabolites: sphaerophorin, subsphaeric acid, ±gyrophoric acid (minor). Substrate and ecology: on acidic rocks at high altitudes World distribution: western North America, from California to southern British Columbia Sonoran distribution: southern California to Baja California, Arizona and Sonora, from 1000-3000 m. Notes: Dimelaena thysanota is characterized by the very dark thallus, its hyaline hypothecium and its chemistry.